Getting into PT School isn’t easy. Every year, 18,000+ students submit their physical therapy school application for 10,000 PT School seats. Less than 50% of PT School applicants will get an acceptance letter, which makes it a very competitive field to enter. This guide was created by two Physical Therapists who were accepted into the #1 ranked PT program in the country. They created the Physical Therapy Application guide below to help students understand how to get into PT School. Download the PDF of the FREE Guide and Get Access to Insider Strategies to Get Into PT School. 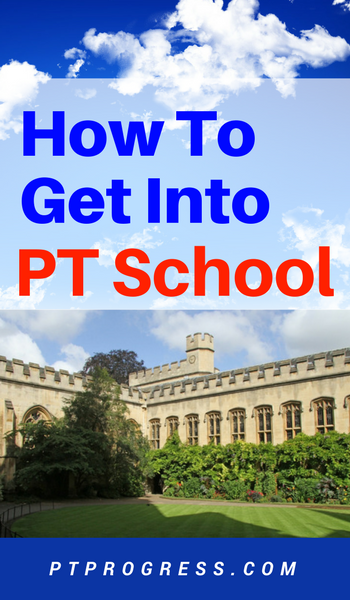 Learn How to Get Into PT School The First Time! Physical therapy prerequisites vary between schools, but most programs require a very similar group of core classes that you must complete before being accepted into their program. These prerequisites can change anytime, but it’s a good resource to compare the requirements between programs. You can use the PTCAS table as a reference between program prerequisites. Exactly how many semesters of each prerequisite depends on the program. You can read more about PT School Prerequisites here. To be honest, the type of major you have in undergrad does not matter when it comes to applying for PT School. Having a degree in biology or exercise science does not increase your chances of getting into PT School. In our PT class, we had an engineer, former teachers, finance majors, an anthropology major, and students with a degrees in athletic training. Your undergrad degree does not matter – as long as you’ve completed the prerequisites for PT School and your application is strong, you’ll stand out from the crowd. There’s a unique option for high schoolers who want to get into PT School. Some DPT programs offer a Freshman Entry Doctor of Physical Therapy degree, a 6-year program that includes both an undergraduate bachelor’s degree and the Doctorate in Physical Therapy degree. This type of program will save you about a year as the typical undergraduate degree is 4 years plus the 3 years it takes to complete a DPT. If you are about to start your undergrad degree and are absolutely set on becoming a PT, then this could be a great option to consider. Expert tip: If you decide that PT isn’t the career for you, you can still complete the undergraduate portion of the program without finishing the DPT. I can’t stress enough the importance of shadowing multiple physical therapists. Try to spend at least 15-30 hours between a few different physical therapy specialties at multiple clinics. A lot of physical therapy programs require over 100 verified shadowing hours, so keep track of where and when you shadow and have the PT sign off on a simple log of your hours. All PT School applications will require letters of recommendation from both a Physical Therapist and another source (like an instructor, advisor, or employer). One of the benefits of shadowing multiple Physical Therapists is that you can ask for a letter of recommendation from multiple PTs. You do not need to obtain a letter from every PT you shadow. If you connected well with the PT you are shadowing, be sure to ask if they would be open to writing a letter for you. Pro Tip: Ask the PT for their email so you can send them your resume and forward the link from the PTCAS application to them. The PT will need to upload their letter of recommendation directly to the PTCAS website. The Graduate Records Examination (GRE) is a standardized test for students who are wanting to pursue a graduate degree. It’s like the SAT, but used for graduate school admissions. Yes, it feels like a hoop to jump through, and it is. As long as you get a passing grade (average around 150 or more per subject) you should meet the requirements for most PT programs. If your score is significantly below the average, consider retaking the exam after using a study reference like the Barrons GRE study guide. Your personal statement is one of the most important elements of your application to PT School. It gives the admissions team a look into your personality, strengths, background, and creativity. Applying to Physical Therapy school is made easier through a central application system called PTCAS. It allows you to apply to multiple programs through a single interface so that you don’t have to keep submitting the same information a dozen times for each application. One of the nice features about PTCAS is that you get status updates on your application, school transcripts, and letters of recommendation. Some programs will require an interview before notifying you of acceptance, rejection, or that you’re on the wait-list. Other schools will let you know without an interview. It can be helpful to know ahead of time if the school requires interviews, so research the admissions process on the program’s website. Develop the Answer to the Question “Why”…. Read the entire article for all 10 tips. What Physical Therapy School Should I Go To? You’ve put in the time and work to complete all the requirements for PT school. You were accepted to PT School and now have to decide which PT school should I choose? My best advice: When it’s time to decide on which PT School you should attend, choose the most affordable option. It doesn’t matter if the school is “ranked” #1 or #101. You will graduate and work alongside of people from all over the country. Your clinical skills will be developed in the clinical rotations you have during school and during your first few years out of PT school. Too many PT graduates are completing school with $150,000+ in student loans. They’re doing this to enter a career that has a starting salary around $70,000. The financial burden of student loans will leave you feeling stressed and crippled under the weight of the debt. Look for ways to save money in school by choosing a program with reasonable tuition (look for state schools) and by keeping your housing and transportation costs as low as possible. The location of the PT School can affect the cost of attendance, so this is a major factor in deciding where to go to PT school. Be careful not to become enamored with the idea of a certain location, neglecting to research the cost of living in the area. If choosing a different location ends up saving you $20,000 in the long run, you’ve made the better choice. A factor that is often overlooked is the boards pass rate. It’s actually helpful to know the 1st Time Pass Rate. This should be above 90%. Personally I believe that you can pass the NPTE boards on your first attempt if you implement the right study program. But it’s still worth considering when you’re making the decision between schools. When you’ve made your final decision, you may have to send in a deposit to the program to hold your seat. Unfortunately, many programs put a time constraint on your decision, forcing you to decide within 14 to 30 days of receiving the acceptance letter. But what if you’re still waiting to hear from another (hopefully cheaper) school? My name is ___________ and I just received the acceptance letter from the program. Thank you very much! This program is at the top of my list and I am honored to be accepted. I do have a question, regarding the deposit. I have 2 outstanding applications at programs that should be getting back with me in the next couple of weeks. I want to make the best decision possible, so would it be ok to extend my deposit deadline for an additional 30 days? Having an additional 30 days may open up opportunities at other programs while securing your seat at the current program. Any Questions About Getting in PT School? I hope this article helps you in understanding how to get into PT School. You probably have more questions, so please ask them in the comments! I am 28 about to turn 29. I started college at 18, took a 2 year break for a religious mission and then came back and finished college at 25. I’m wondering if there are any schools that require certain classes to be completed within a certain time of application? And if so, how to find out which school and how long the period is. Thanks!!! Hi Austin, I’m in a similar boat, except for the birth of my baby, I took a few years break after my bachelor’s. From what I find from the schools I’m looking at you are supposed to have your pre-reqs done within 5 years of application date. Check with schools individually though. Does it negatively impact my application if I re-apply the following year if I don’t get accepted the first time around? I am deciding if I should apply now with 1 year left of undergrad or wait Agre completion to give myself the best chance?